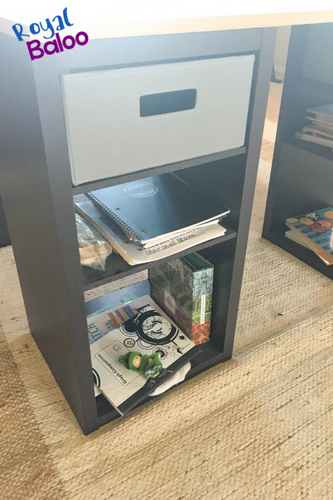 Come check out our homeschool room on a budget and perhaps get some inspiration for your own room! 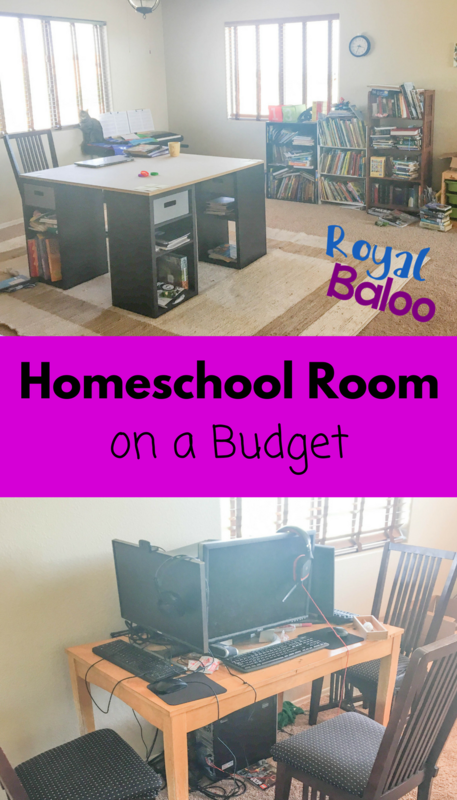 Homeschool rooms don’t have to be expensive!Last year I posted about homeschooling in a small space. But earlier this year we moved and we incredibly lucky in the new rental we found. It has this amazing upstairs space – probably meant to be a “family room” – that we didn’t need for anything else. The tricky part was, we didn’t have a budget for a homeschool room. So this is the story of how we decked out this space and made it work for us on a budget. All in all, most of this we sourced from other parts of the house. We used things we already had as much as possible. The desk for the computers was our old kitchen table, for instance. 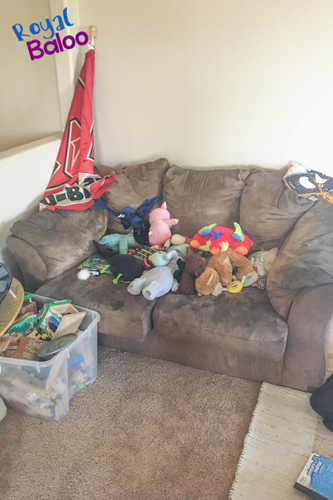 We collected free items from friends, family, and neighbors who didn’t want it. So it took time to gather everything, and we are still gathering more. I’d like more bookshelves. The point is to be patient and accept imperfect items. 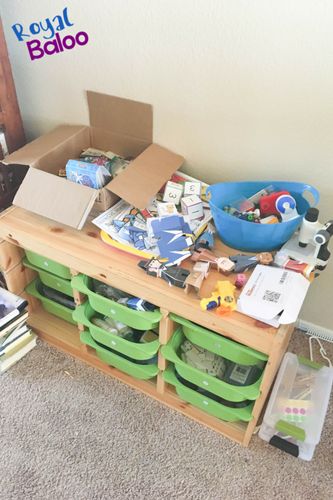 The funny part is, we still homeschool mostly the way we did with a small space. We just also have another place we can use now. So my favorite part of the new school room is this desk we made. It’s fantastic. We also don’t use it as much as I’d hoped, sadly. We built this ourselves and modeled it after the one from Confessions of a Homeschooler. But we don’t have an IKEA nearby so I had to figure it out on my own. 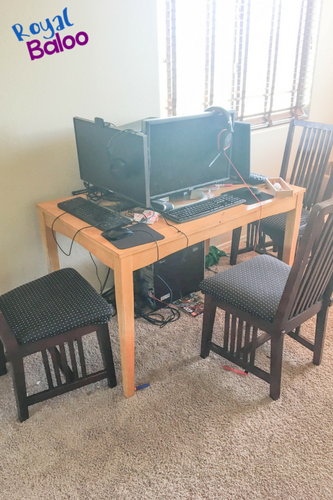 All in all, we spent less than $130 for a 4-in-1 desk. I’m hoping to get these plans typed up and posted within the next week to share. In these desks, each boy has their own spot with their own stuff. The gray basket contains pencils, pens, markers, scissors, etc. Whatever they could need. 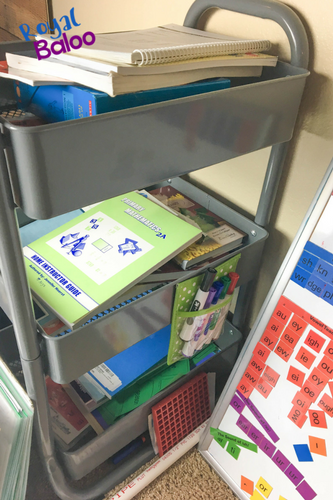 The bottom shelves contain notebooks and some of the curriculum I wanted to keep separated out. I also like to leave our Kindness Elves randomly around as a pleasant reminder to be kind. Despite that the desk is my favorite, most of our “school times” are still spent at this board. We use All About Reading/Spelling and Singapore Math. Both are great with the white board. 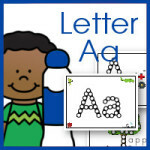 Plus we have magnet shapes that are perfect for math. This is a new addition from Target. It’s a great little cart set. We have one shelf for each kid. It contains their Singpore Math books and their AAR/AAS stuff. I find it super convenient to have it next to the white board. Naturally, the bookshelves are the most important area. Easily my favorite! And we can finally fit all of the school/kids books in one room. We do have another bookshelf in the boys rooms but this is the majority of our books. It’s organized, too! The biggest shelf is out chapter books. The middle shelf is picture books. 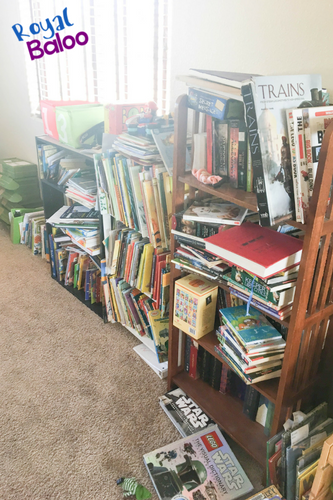 The last shelf is non-fiction, easy reader books, and additional school books. And now we have a reading area! We had an extra couch after we moved and decided a comfy reading area in the school room would be fabulous. It’s also now the home of the stuffed animals. We have been lucky in the computer department. One of these we were gifted for free. It’s not fancy schmancy, but it does the job! One is my 10-year-old computer that is barely hanging on at this point. The last was a gift for Baloo for his birthday a few years ago. We do a lot of computer games so these computers get a lot of use! Shelves! These are from IKEA and they are so sturdy. Right now they are holding a lot of extras that we don’t use every day. Colored pencils, stickers, dice, dominos, Pokemon cards, etc. 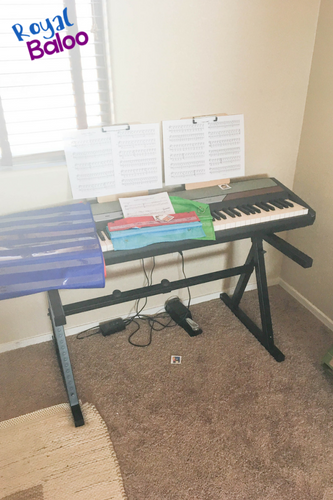 I finally got a dedicated space for my keyboard! This was an expensive keyboard when we bought it forever ago but I haven’t had a place to keep it out all the time. Now I do! So happy! We also keep our Ukuleles in this area and our sheet music is stored here. We have never been good at hanging pictures but I wanted to have an art wall. So we’ve hung up some art from the boys and also these more inspirational pieces. The Superkids Manifesto is from the Superkids Activity Guide. 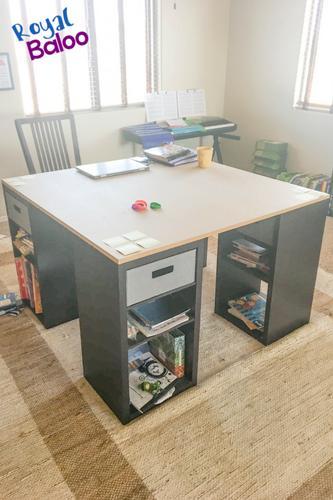 So there it is, our new homeschool space! It’s rarely this clean, but the cat is usually perched on the keyboard. She loves looking out the window. 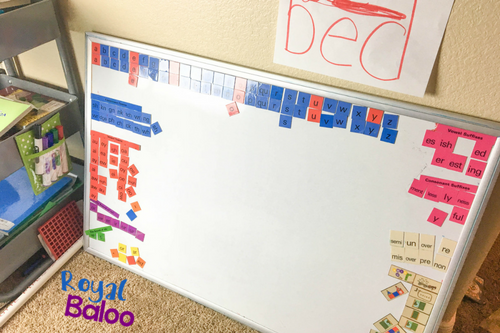 Get more homeschool room inspiration from the iHomeschool Network during Back to Homeschool Month!